Please note that open containers are ideal for cactus and succulent plants when you choosing glass terrarium, open terrarium are better suited to dry plants like succulents. Our open containers are ideal for cactus and succulent plants when you choosing glass terrarium, open terrarium are better suited to dry plants like succulents. 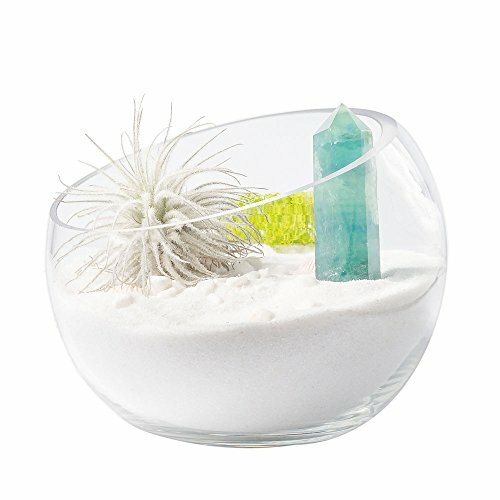 Works well as air plant terrarium also, terrariums are one of the most popular ways to display air plants. The biggest danger in growing succulents is overwatering, so you'd better put some gravel or small stones in the bottom for drainage. Body diameter: 5 7/8". Opening diameter: 4 3/4". Lowest height:3". Highest height: 4 3/8" .